TemplatePlazza have released a new theme ready made for a Digg style website, complete with component and three modules. Want a Digg style site? Now you can with this. The theme looks good, the features are very exciting and if you were looking for something a little different then this could be it. 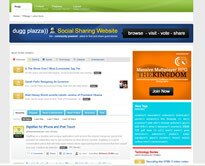 I'm not yet fully sure of all the features, I'm hoping you can just put in a RSS feed to populate the site, but I will be taking a closer look and it might even get used on a site or two, but as with all TemplatePlazza themes you will get excellent support and the ability to make the theme look exactly how you want it to look with the source files. The theme is also valid Valid XHTML and CSS, comes with four design options, nine font families with three font sizes. The theme also comes with fifteen fully collapsible module positions. For more information or a demo click here.